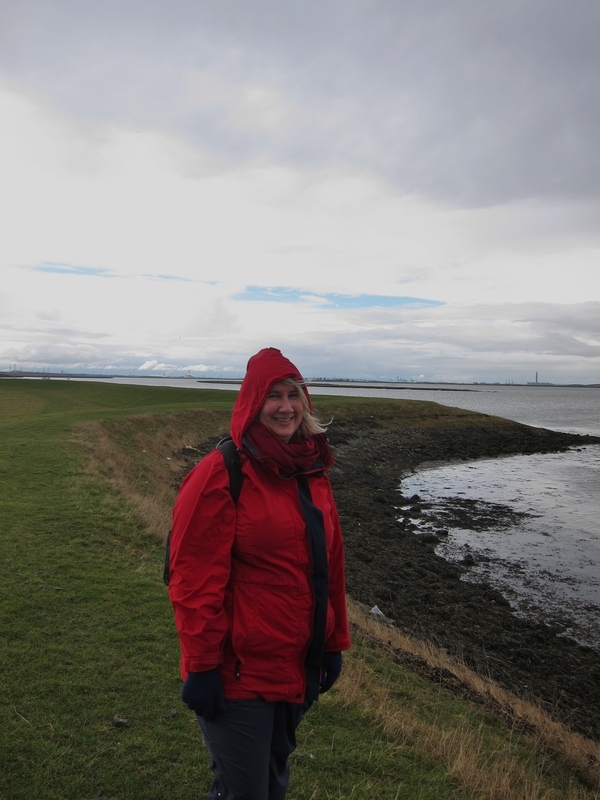 Several firsts today – the first day of an extended walking trip, the first sight of the open sea – previously I have been in the estuaries of the Thames, the Medway and the Swale – and my first 100 miles completed! Work has been manic so I had a few chores to do before leaving, and what with one thing and another, I didn’t actually set off from Faversham until about 12.15. It was great driving over the Dartford Crossing – I took a quick glance down (I always have a faint sensation of vertigo on that bridge, as it is very high, with quite flimsy crash barriers, and the curved shape gives the impression almost of flying) a nd saw the aggregate works that Bridget and I had walked past back in January. It took a pleasing hour to get from the crossing to my start point! 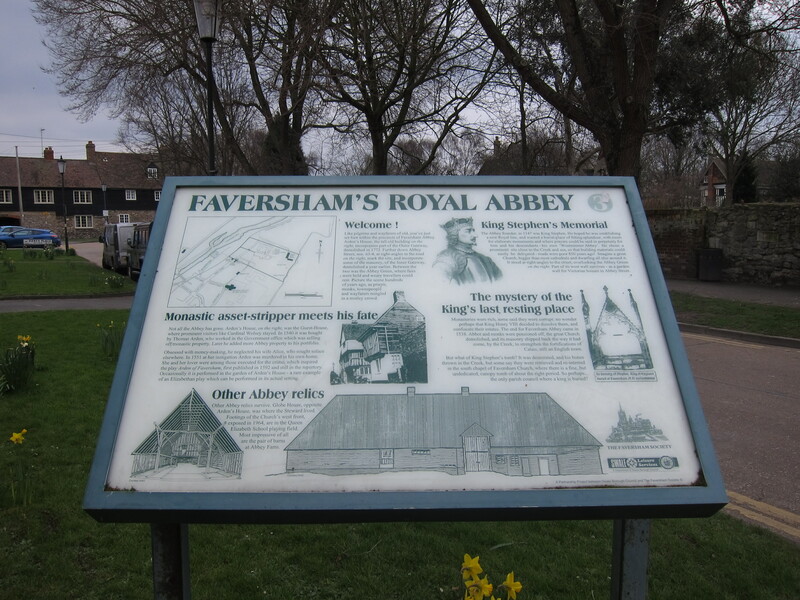 I saw more of Faversham this time – it is a pretty town, with a number of Tudor houses still standing,, and the traces of the Norman priory’s walls still visible as well as an interesting mix of pleasure boats and Thames barges bobbing on the creek. Apparently, much of the prosperity of the town (after the dissolution of King Stephen’s 1148 Abbey in 1538) was based the development of the gunpowder industry. The path then follows the East bank of the Oare Creek, barely a stone’s throw from the walk into the town that Deb and I did a couple of weeks ago. The weather was fine, but the wind was bitterly cold – the first time I have actually felt cold since I began. Apparently the temperature was 3 degrees, but the biting East wind made it feel much lower. As I walked on towards Whitstable, the Isle of Sheppey receded, and I was faced at last with the open sea. Whitstable is very attractive – with more oyster vending establishments than I had imagined possible. Unfortunately, I don’t like oysters, so did not sample any. The path clings to the coast all the way. 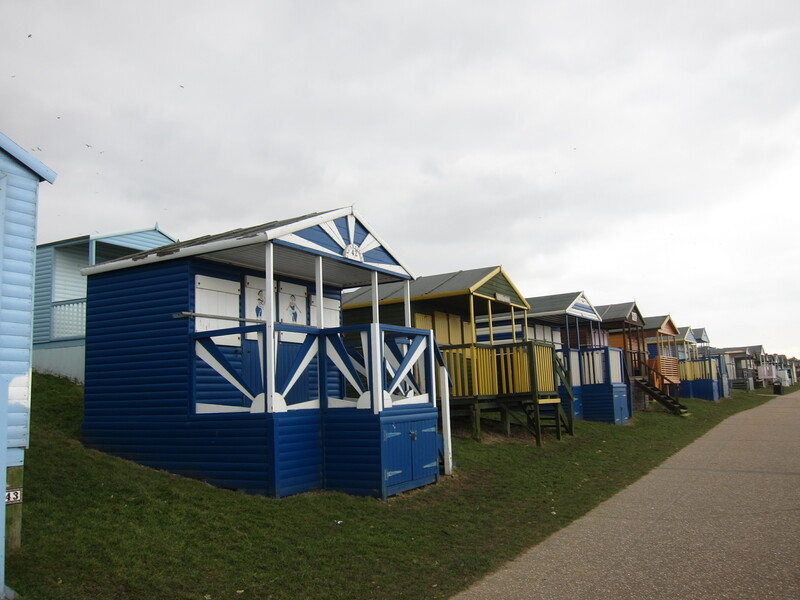 On the inland side, there are rows and rows of beach huts, all the way from Seasalter, through Whitstable to Herne Bay. Very little sign of them being in use yet, this year! 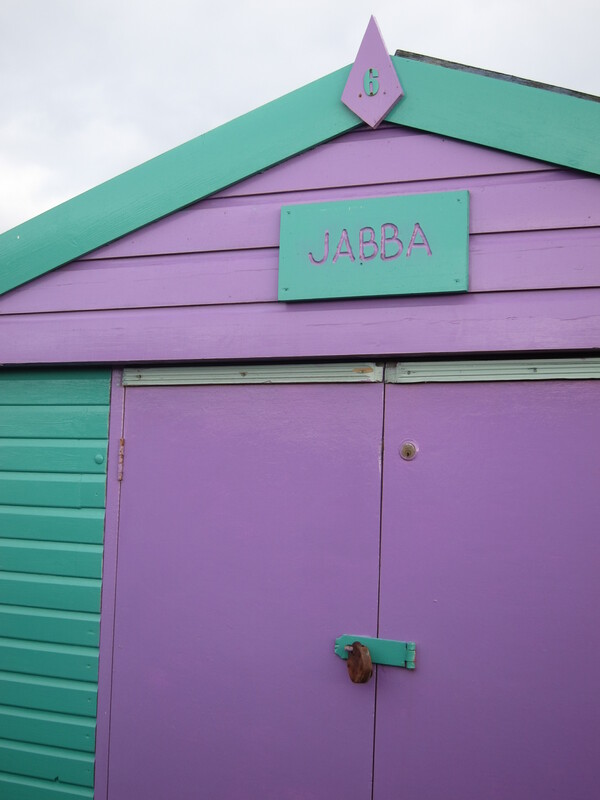 It was fun to read the names – everything from Dunroamin to the Tardis House, via Jabba! Far in the distance, out to sea, is a huge wind farm. I know they are not to everyone’s taste, but I rather like them. I reached the station at Herne Bay around 6.15pm, and took the train back up to Faversham, driving to arrive at my extremely stylish (not – unless you like receptionists who are top to toe tattoos with a phantom fag hanging from the bottom lip) around 7.45. I ate in a local Indian restaurant, and was delighted to find a Welsh speaking ethnically Indian waiter from Swansea. We had a great day on Sunday! 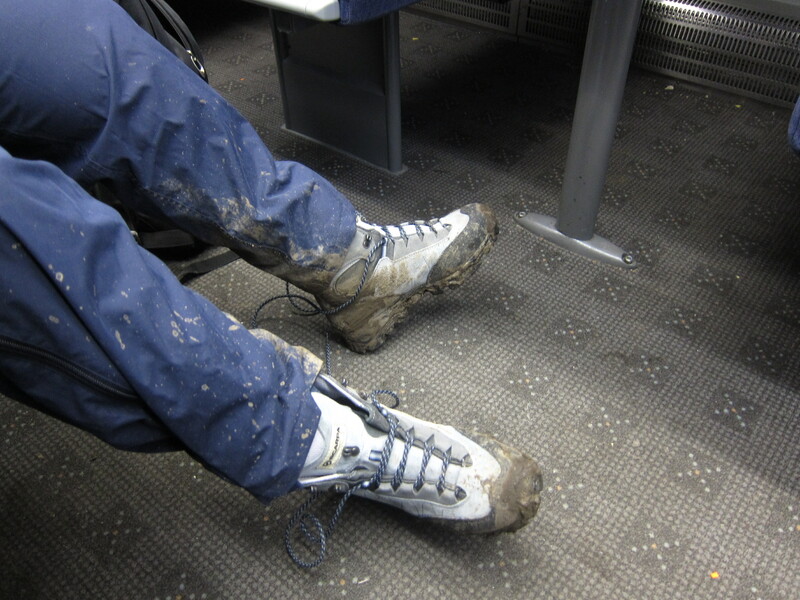 Deb was breaking in some new boots – before and after shots below. For those of you familiar with her tendency to blisters, the new boots seemed to be pretty good – only three compeeds by the end of the day. 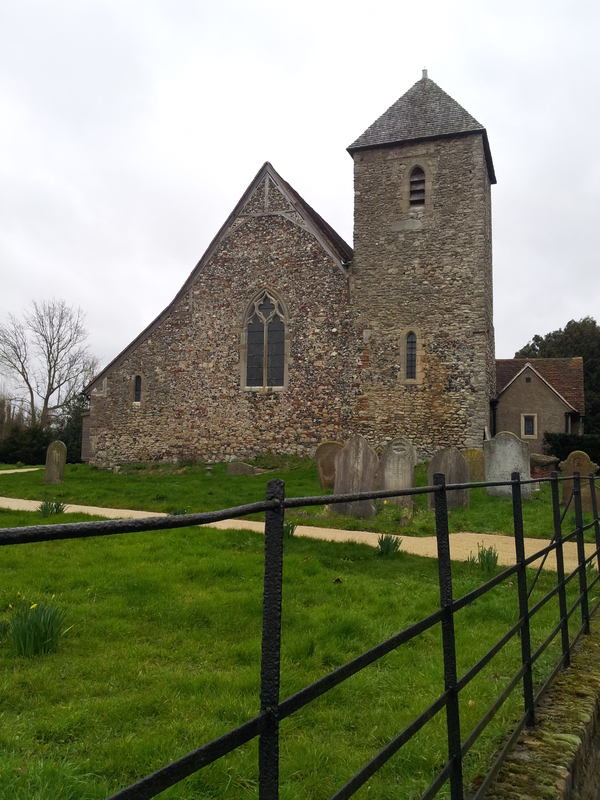 The outskirts of Sittingbourne are not remarkable, but we were soon out of the industrial zone, and back on the badly waymarked Saxon Shore Way. We passed a property that had the air of a footballer’s retirement home – complete with silver cups in the window, trophy wife jumping into Range Rover and exceptionally noisy Dobermans, but set in the middle of what seemed to be a scrap yard. Perhaps he had gone up in the world from Gravesend…. The path hugged the shore all the way, but began to seem much more rural. Saw the first lambs on the route, and a very neat cherry orchard. We stopped for lunch in Conyer (see pub review.) Conyer is an attractive harbour a long way inland on the Swale Estuary, with quite a few yachts and houseboats lined up. The tide must be extreme as most of them were beached when we arrived – passing another National Cycle Way marker, showing Dover now only 45 miles away (and Inverness 1,151 miles!) I am glad that RBS is spending its (our?) money on the National Cycle Way – almost as glad as I am that it spends our money sponsoring the Six Nations Rugby. Incidentally, did you see the fabulous Welsh victory? Tee hee! Arriving in Conyer, it was raining lightly, and it poured whilst we were lunching, however the rest of the day we were very lucky with dull but dry conditions, and the odd shaft of sunlight in the late afternoon. It was shining delightfully on Whitstable, (which I assured Deb was Faversham, much to her horror – “Isn’t that rather far away?” she asked. “No, no, only 5 miles. The light is deceptive.”) In reality, she was quite right – Whitstable is another 15 miles along the coast. 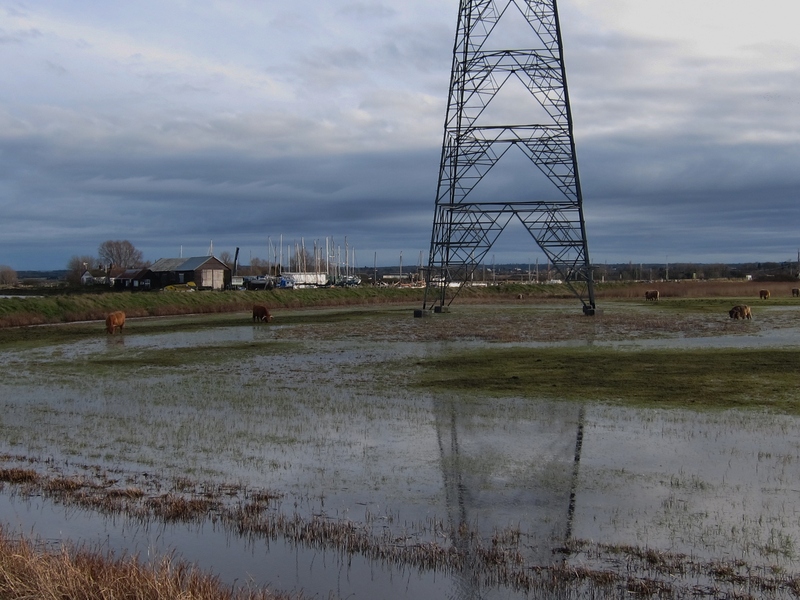 As we walked down the Oare Creek, we passed a field of what appeared to be Highland Shorthorn cattle – like the ponies of Gravesend, they must be used to wet feet, as some of them were up to their stomachs in water. Finding the station in Faversham was a bit tricky. We made several wrong turns – all my fault, as Deb has an exceptionally good sense of direction and I definitely haven’t. We made the train by a few minutes. Next updates will be from the Easter trip, which will take me to Littlehaven. 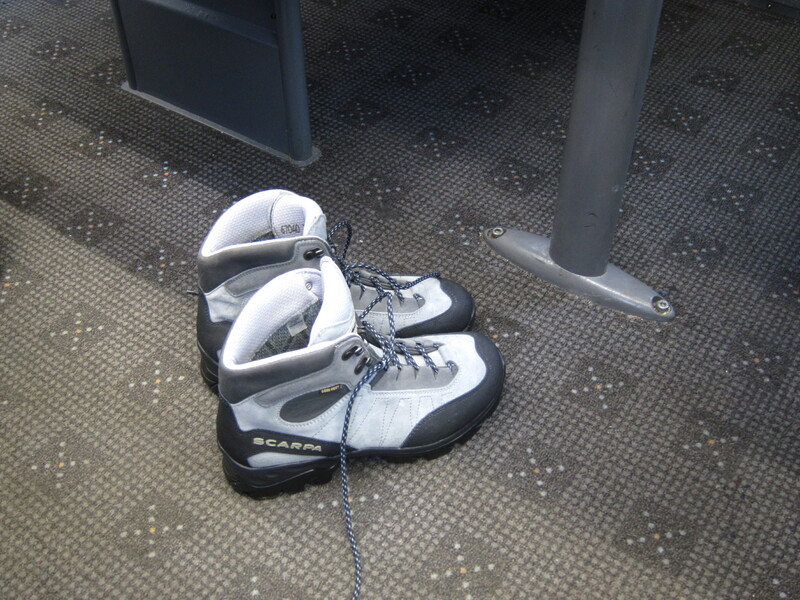 It was good to be back on the trail again – not that I have been neglecting my walking boots! Since my last Coast Walk jaunt, I have done a couple of days on the Wessex Ridgeway with Vicki and Jon, and a week in the Sahara desert, trekking with camels where I made some lovely new friends who are going to sign up for bits of the coast walk. It is fair to say that the North Kent coast is very different from the Sahara…. I set out from Gillingham at 11.15am about an hour later than intended, owing to “overrunning engineering work” on First Capital Connect. However, with the evenings getting longer it did not matter too much. I started at Gillingham rather than going back to Strood, as the latter is quite far inland down the Medway Estuary and Gillingham is the nearest point back on the main Medway coast. I have decided that it is quite within the spirit of the enterprise to stick to the coast and not go in and out of all of the creeks, rivers and estuaries. I am still on the Saxon Shore Way, which here hugs the modern coast. Although still on the River Medway, the strong winds and lie of the land made it seem far more like open sea. It was pretty rough that day, and the water was coming up onto the bank. The Saxon Shore Way is very poorly waymarked, so I spent a good deal of time with my map wrapping itself round my ears as I tried to determine the route. In particular, on the Iwade peninsula, the map shows rights of way, but on the ground there are extremely stern signs forbidding entry to areas of bird nesting. 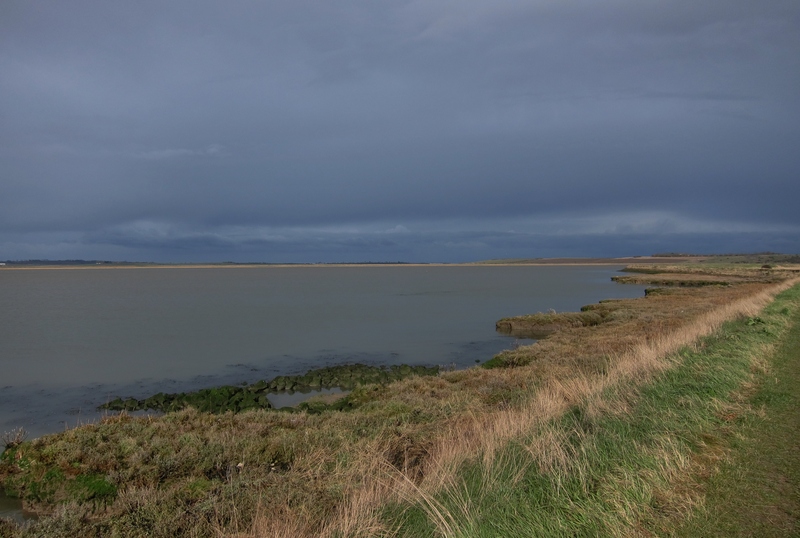 Much of the walk is on a raised bank at the water’s edge with marshland to the inland side. I saw a few more interesting birds this time – but nothing especially unusual: Canada geese, some rather nice mallards and a few ducks of the Jemima variety. I arrived in Sittingbourne just in time to see the train I had hoped to catch depart – but I had a stash of chocolate and pistachio nuts left, so didn’t mind too much. 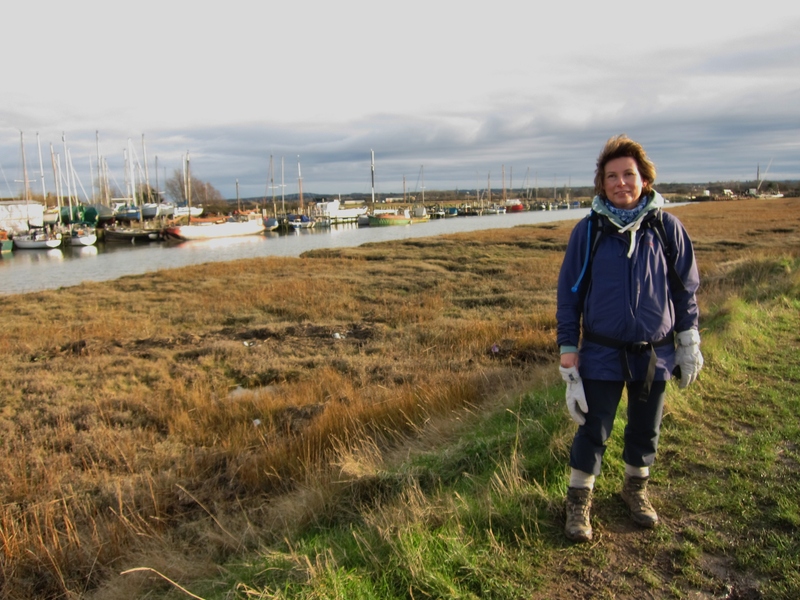 I am delighted to say that my friend Deborah is joining me on Sunday 17th for the leg to Faversham, and that I will be accompanied over most of Easter. Beth will be contrasting the Sahara with Kent on the Herne Bay to Margate stretch, then that stalwart Bridget will join me at Dover, with Chris and Rita coming along from Eastbourne. The link below goes to a map to give an idea of progress to date, from the “n” of London on the far left, to Sittingbourne on the right.